Join Us!!! We are looking for someone to help us cover Brunei basketball. Please send us an e-mail. 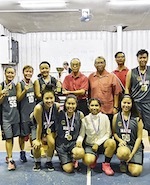 The finals of the Brunei Men's Veteran and Women Open Basketball Tournament 2019 was held at the New Village Court in Seria last Saturday. 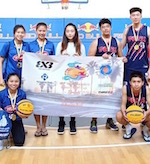 The tournament was organised by the Belait District Basketball Association (BDBA). JC Weldings won the Men's Veteran Category while The Redz and Radikal Shooters were in the second and third place. GHK won the Women's Open Category while Le Doux Patisserie and Perlas Pilipinas were in the second and third place. Chairman of BDBA Koo Kong Loi presented the medals and trophies to the winners of the tournament. BELAIT District Basketball Association (BDBA) will host the Brunei Men's Veteran and Women Open Basketball Tournament 2019 tomorrow at the New Village Basketball Court in Seria. The tournament will see eight teams competing in two separate categories across two weeks. The categories to be competed are Veteran and Women. Teams that have registered include JC Welding, The Redz, Radikal Shooter, and Loell's Amigos Cowboys for the Veteran category; while Le Doux Patisserier, GHK, The Redz and Perlas Pilipinas to compete in the Women category. The tournament will be judged based on the rules and regulations outlined by the International Basketball Federation (FIBA). HONEY Carsmart beat Mum Bakery Mobile World 86-77 in the Women's category of the Low San Basketball Tournament at the Brunei Basketball Association (BBA) Basketball Court in Batu Bersurat, Gadong last night. It was an intense match where both teams led each other from the beginning to the end. The second match of the evening was between TSL and JHY Enterprise in the Open Category. Meanwhile, on Wednesday evening, Toolbox edged YTE 90-82 in the Open category of that night's second match. More matches will be played tonight where Team Airish/TSL will go against TK Tea House in the Veteran Category at 7.15pm while Wolves will face Tool Box in the Open Category at 8.45pm.